The Rite of Spring by Pina Bausch (1978, 36 mn), French film by Pit Weyrich (in French). Original title : Le Sacre du printemps de Pina Bausch. Pina Bausch and the Wuppertaler Tanztheater (1980?, 19 mn), short German film by Ulrich Tegeder. Original title : Pina Bausch und das Wuppertaler Tanztheater. *One day, Pina asked for... (1982, 57 mn), Belgian colour film by Chantal Akerman. 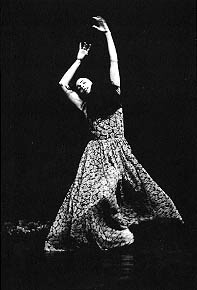 Pina Bausch working in Wuppertal, Venice and Avignon. Rehearsals and extracts from Komm Tanz mit mir (1977), Kontakthof (1978), Walzen (1982), 1980 (1983), Nelken (1983). Original title : Un jour, Pina a demandé. *Pina Bausch and her two cousins (1983, 66 mn), French film by Jo Excoffier, Pierre Biner and Jean-Pierre Garnier. Original title : Pina Bausch et ses deux cousines. What do Pina Bausch and her dancers do in Wuppertal? (1983, 115 mn), documentary film by Klaus Wildenhahn. Watch Walzer take form during the rehearsals for its first performance. Extracts from the repetition. Performance of Bandoneon. The Queen's complaint (1989), colour film, dramatic comedy by Pina Bausch. Acting : Mariko Aoyama, Anne-Marie Benati, Bénédicte Billiet, Rolando Brenes Calvo, Antonio Carallo. Duration : 104 mn. The first film by Pina Bausch, produced between October 1987 and April 1989. A "collage" of different scenes, depicting the methodology of Bausch in the Tanztheater Wuppertal. Original title : Die Klage der Kaiserin. *Catherine's passion : Italy, Belgium, Germany (1982, 26 mn), French film by François-Marie Ribadeau. Catherine Richet, dancer, presents Carolyn Carlson, Maurice Béjart, Pina Bausch. Extracts from the Rite of Spring. Original title : La passion de Catherine : Italie, Belgique, Allemagne. Cafe Müller (1985, 52 mn), performance of the homonymus choreography (1987). *From free dance to the Tanztheater : German expressionism (1992, 53 mn), documentary film by Sonia Schoonejans, third pard of a film series on 20th century dance. The evolution of expressionist dance, from Rudolf von Laban and Mary Wigman, to Pina Bausch and the Tanztheater. Original title : De la danse libre à la Tanztheater : l'expressionnisme allemand. The Search for Dance - Pina Bausch's Theatre with a Difference (1994, 29 mn), documentary film by Patricia Corboud. Pina Bausch and the Tanztheater Wuppertal. Choreographic analysis of her works, using commentaries by Pina Bausch herself, and by the dance critic Jochen Schmidt. Extracts from Arien, Kontakthof, Le Sacre de Printemps, Blaubart, Auf dem Gebirge hat man ein Geschrei gehört, Nelken, Bandoneon, Walzer, Palermo, Palermo, Die Klage der Kaiserin. European Tanztheater (1997, 62 mn), film by Isa and Harold Bergsohn. The story of the Tanztheater, Wuppertal, through choreographies and interviews. The Pina Bausch Tanztheater (1998, 50 mn), German documentary colour film by Christiane Gibiec. Original title : Das Tanztheater der Pina Bausch. Pinatz, Reverenz an Pina Bausch, colour film. Pina Bausch's Theatre, French colour film. Original title : Le Théâtre de Pina Bausch. 1980, a piece by Pina Bausch, colour film. -Bentivoglio Leonetta (text) and Delahaye (photos), Pina Bausch, Solin 1986. -Hoghe Raimund (text) and Weiss Ulli (photos), Pina Bausch : Histoires de theâtre dansé, Suhrkamp 1986, L'Arche 1987, 1988. -Kay Roland (text) and Man Leonore (photos), Pina Bausch et Compagnie, (12.10.90/C.G.P.) L'Arche 1988. -Beydon Martine, Pina Bausch, analyse d'un univers gestuel, Cahiers de la Bibliothèque Gaston Baty, NG2, Institut d'Etudes Théâtrales, Université de Paris III, Service des Publications de la Sorbonne Nouvelle 1988. -Maarten Vanden Abeele, Pina Bausch, Editions Plume, prefaces by Federico Fellini and Akira Asada, Paris 1996. A selection of books on Pina Bausch ! The photos have been taken by Jochen Viehoff lors during a performance of Für die Kinder von gestern, heute und morgen. Ein Stück von Pina Bausch. (Copied from the official Pina Bausch website ©Jochen Viehoff ).